Why a Nordlicht bottle / sidewall dynamo ? 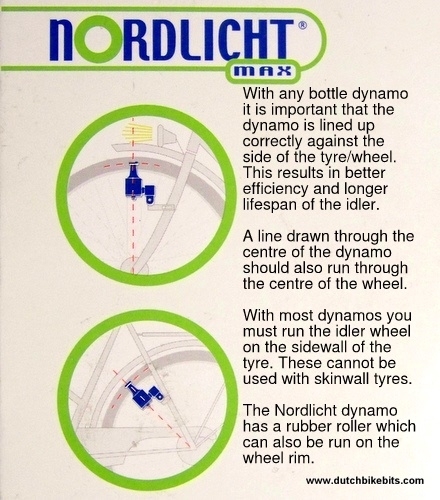 The Nordlicht was the best ever sidewall dynamo design. A far cry from unreliable cheap plastic dynamos, Nordlicht's robust and efficient design, built mostly out of solid metal rather than plastic and with sintered bronze bearings, gives reliable bicycle lighting for years. This is why we have used them for many years on most of our own bicycles. They're efficient, keep working, and quietly get on with the job of generating electricity to make your lights work. These days many people use hub dynamos. I like hub dynamos a lot too, but they do also have drawbacks. These include weight, expense and the need for a new wheel it you want to retrofit a dynamo. What's more, even the best hub dynamo creates some drag when your lights are out. I still use sidewall dynamos on own my bikes because they still have these advantages. It is especially helpful to consider a Nordlicht bottle dynamo if you wish to add a lightweight but permanent lighting system on a sport or fast touring bike, but they also have the advantage of simply being much easier to retrofit than is a hub dynamo to any type of bike. 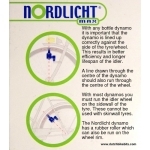 The Nordlicht dynamo can be used with any of the dynamo front lights that we sell, from the outstanding IQ Cyo through to the rather less expensive but still very good Basta Sprint headlight and optionally one of the dynamo rear lights (or you can use a battery rear light). With a bottle dynamo you can buy the least expensive versions of dynamo headlights, those which come without a switch, because switching is achieved by moving the dynamo away from the wheel. We have the dynamo in three versions, as shown above. There's a choice of chromed silver or hard black epoxy finish with steel rollers or silver with a rubber roller and a slightly longer bracket. All are "Left" hand versions, which is what most people need. Bikes which have a dynamo mount on the front fork usually have it on the left side which suits a left handed dynamo. For mounting at the rear of the bike on the right hand side you also want a "left" dynamo. 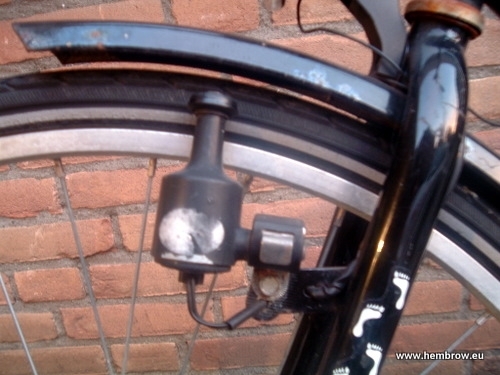 If your bike doesn't have a dynamo bracket on the frame, please also buy a suitable dynamo bracket. The steel roller dynamos are intented for use on the side-wall of the tyre. The steel roller has a long life-span on its own but we also offer a third party rubber roller which fits over the steel roller for those who prefer this setup (it rolls slightly better due to the larger diameter and can be slightly quieter). The rubber roller can be used on either the side-wall of the tyre or the rim. A rubber roller operating on the rim results in quieter operation than operating on the tyre. 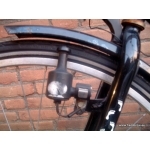 One of the additional photos shows a very old (nearly 20 years) Nordlicht Dynamo which outlived two other bikes, and is now on a bike which takes one of my children, a student in the world's cycling capital, Groningen, to and from lectures in all weather. This photo is included just to demonstrate the reliability of the Nordlicht design. The new version of the Nordlicht dynamo which we sell differs from the old type because it has two connections so that you don't have to rely on earth running through the frame. This makes it even more reliable than the older version. For a right hand dynamo, see our second favourite dynamo, the AXA HR. This is also a slightly less expensive option. For help with choosing lights to go with the dynamo or for assistance with installation for efficient and reliable operation, follow the instructions in our article about choosing and setting up dynamo lighting. Don't like bottle dynamos ? That's your choice. We sell hub dynamos as well and they work with exactly the same lights as the Nordlicht.